The Curious Incident of the Dog in the Night Time. Theatre Royal, Nottingham (Director: Marianne Elliott); reviewed by Stacey A. Bedwell. Having read the original award-winning novel by Mark Haddon several years ago as a psychology undergraduate, I was eager to see the stage adaptation as a more mature and experienced neuropsychologist. I attended the show at Theatre Royal in Nottingham in April with a friend of mine, Francesca Williams, a clinical psychologist in training at the University of Nottingham. Neither I nor Francesca knew what to expect and entered the theatre with open minds. From the very outset the play surprised me on multiple levels. 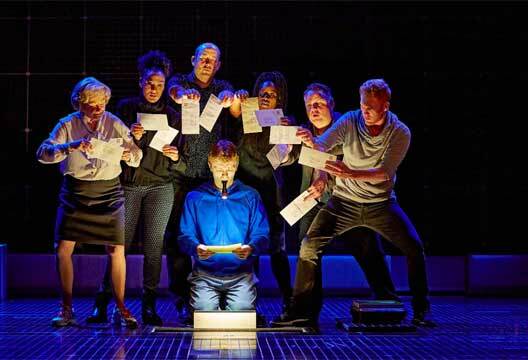 The Curious Incident of the Dog in the Night Time is a mystery story with a twist, it follows a teenage boy with an autism spectrum disorder (ASD) as he struggles to deal with changes in his home life whilst simultaneously dealing with difficult social interactions. From the perspective of a psychologist, I feel that the stage adaptation of Haddon’s bestselling novel gives a general audience a rare chance to be immersed into the world of someone living with ASD, without being at all clinical or academic in content. As with portrayals of any neurological deficit or psychological disorder, it would have been easy to make the audience feel sorry for the main character or his on-stage family. However, the cast and crew manage to tell the story in such a light-hearted, but still emotional, way that the audience are left both educated and entertained. With the inclusion of several incidents of ‘breaking the fourth wall’, whereby the cast members engaged directly with the audience, there were plenty of opportunities for laughter in what could easily have been presented as a much more serious story.